The North Reformed Dutch Church was erected in 1839, north of the Watervliet Arsenal at 1501 First Avenue in Watervliet. Another Dutch Reformed Church had been in existence south of the Arsenal since 1814, called Reformed Protestant Dutch Church of Washington and Gibbonsville. The steeple of the North Church was blown off in 1854, along with the Meneely bell, which had to be replaced. This bell was last rung during the Vietnam War. There were also two disastrous fires – in 1900 and 1924. 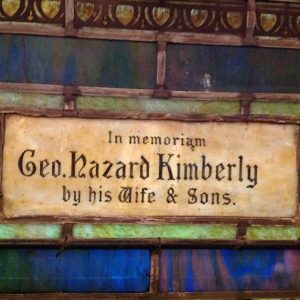 Many prominent families were members of the North Church, including Meneely, Schuyler, Oothout, Lansing, Witbeck, Gibbons, and VanDenburgh. The congregation of North Church split in the 1860’s and many members in 1872 moved into a new church building at 601 Fifth Avenue which became the Jermain Memorial Presbyterian Church built as a memorial to Silvanus P. Jermain by his son James B. Jermain. 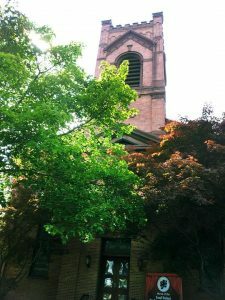 In 1968, North Reformed and the First Baptist Church in Watervliet united to form Christ Church. Christ Church closed in 2001. 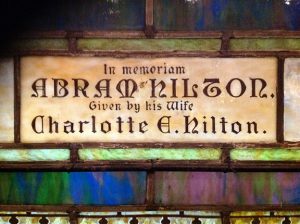 The only memorials that remain are the windows in the sanctuary. The annex or church hall which was built in 1865 today houses the Watervliet Historical Society and Museum. Many thanks to the Watervliet Historical Society for information provided on the North Reformed Dutch Church. 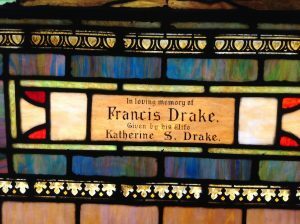 The following Memorial Names that were found in the North Reformed Dutch Church were transcribed by TIGS volunteer Rebecca Rector.